J.R.R. Tolkien was a British writer, poet, and professor. He is best known as the author of The Hobbit and The Lord of the Rings trilogy. 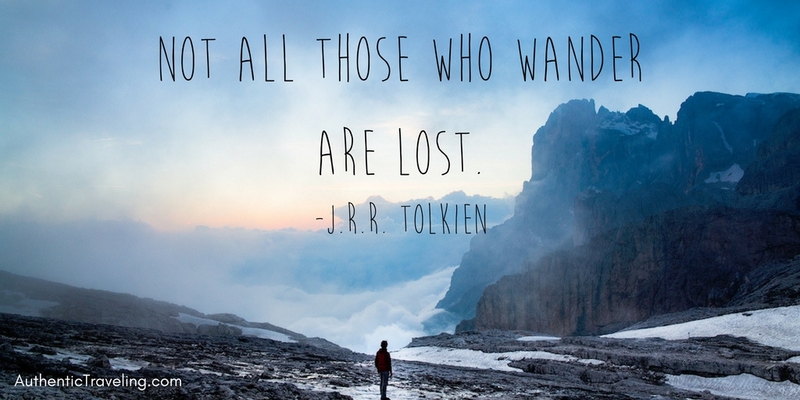 This week’s quote—“Not all those who wander are lost”—is part of a poem inside The Fellowship of the Ring, the first book in The Lord of the Rings trilogy. Within the novel, the poem is intended to illustrate that appearances can be deceiving and that the ultimate intentions of others are not always made apparent by their actions. Somewhat unsurprisingly, this quote has become the de-facto creed of vagabonds and long-term travelers. You can find it in Instagram bios, on Pinterest boards, and tattooed on the arms of Coachella attendees. And if you were to ask a random person on the street if they agreed with the message of the quote, I believe that most would say ‘yes’. However, I still feel as though people who decide to explore the world and themselves for an extended period of time—especially if they do so before getting a degree or a “real job”—are almost universally stereotyped as being confused or without a plan, regardless of their motives for travel. But the people I’ve met on the road usually don’t fit this mold. Rather, the majority have had clear objectives for their travels—to learn about themselves, to see another culture, to feel alive, to start a business. Sure, there are some nomads who wander without a clear direction or goal. But even then, I wouldn’t call most of them lost. Being lost means that you’re completely unable to find your way. And from personal experience, those who are brave enough to leave home and face the unknown are almost always more focussed than they appear. I also sense a bit of jealousy in the words of those who criticize wanders for being lost. In fact, I think it’s almost always a lazy attempt on the critic’s part to avoid confronting their internal demons. Perhaps they regret not prioritizing travel and self-exploration over financial security, or maybe they wish they didn’t have so many things tying them to home. Whatever the reason, I think that such people are doing themselves and others a lot of harm by at least addressing these issues. Certainly, not everyone has to travel, and no, taking that well-paying job to cover your student loans is not a bad idea. But if you feel that call to hit the road, if you feel as though your soul is somewhat empty because you’ve never ventured outside your comfort zone, well then, maybe it is time to reconsider your options. Perhaps, you, in reality, are the lost one.